Look I don't agree with Obama on everything; in fact, he's too centrist and cautious for my political taste. But I like his style. He's a skinny guy with a funny name, just like my own father, just like I was (I'm no longer skinny). 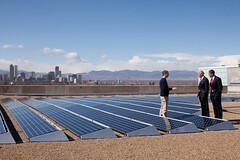 I love this picture of Obama on the roof with the solar panels. I spent a lot of time in childhood on roofs, or craning my neck at bridges and cathedrals, with my father, a civil engineer. Dad loved solar power, too. He worked on the structure of the solar array for NASA's space station as a research project while he was a professor at NC A&T State University. Thank you for the kind words you posted on my blog. I find yours to be very informative! It's great seeing a president on a roof with solar panels on it. Wonderful to know he's open to something different than the current status quo. Lastly, I wanted to say that I'm particularly fond of your funny name! My daughter is a Leila as well. She is a very spunky little girl who most definitely has a big personality.